Location: Worcester Art Museum, Worcester, Ma. Matthew 4:10-11 Jesus said to him, Away from me, Satan! For it is written: 'Worship the Lord your God, and serve him only.' Then the devil left him, and behold, angels came and ministered to him. In this painting Cole provides us with two sources of primary light – the distant horizon and the celestial spot light that shines down directly on an exhausted yet satisfied Christ. The angles, supplicant in their service, provide food and drink. In contrast to the barren stretches of landscape behind him, Jesus is very cozy in the intimate group in the foreground. Despite the esteem with which Cole's allegorical works were regarded, some patrons preferred his identifiably American scenes. 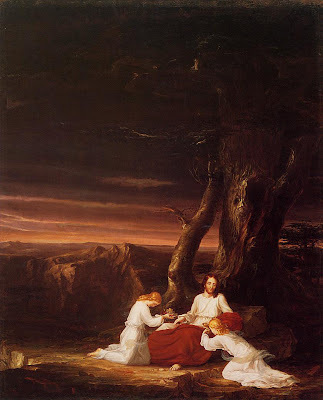 Cole was disappointed at this preference, and paintings like Angels Ministering to Christ in the Wilderness seem to be an attempt to satisfy both his desire for scenes invested with moral or literary meaning, and his patrons desire for pastoral and natural imagery. Thomas Cole (February 1801 – February, 1848) was an English-born American artist. He is regarded as the founder of the Hudson River School, an American art movement that flourished in the mid-19th century. Cole's Hudson River School, as well as his own work, was known for its realistic and detailed portrayal of American landscape and wilderness, which feature themes of romanticism and naturalism. He was born in Bolton, Lancashire, England, and in 1818 his family emigrated to the United States, settling in Steubenville, Ohio. Cole learned the rudiments of his profession from a wandering portrait painter named Stein. However, he had little success painting portraits, and his interest shifted to landscape. Cole's unexpected death in 1848 at the young age of forty-seven was deeply mourned in New York art and literary circles. Both his art and his legacy provided the foundation for the native landscape school that dominated American painting until the late 1860s.